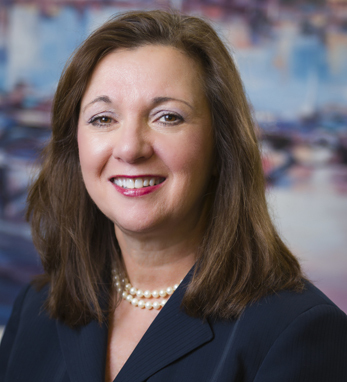 Trish O’Keefe is president of Morristown Medical Center and vice president of Atlantic Health System. Under her leadership, Morristown Medical Center was named one of America’s 50 Best Hospitals two years in a row, in 2017 and 2016 – among many other national recognitions – by Healthgrades. Raised in northern New Jersey, Trish received her Bachelor of Science in nursing from Wilkes College in Wilkes-Barre, PA, and her Master of Science in nursing administration and Ph.D. from Seton Hall University in South Orange, NJ. Her first job was as an aide in a nursing home, where she developed a love for the stories that the patients from the “greatest generation” wanted to tell. This passion for patient care sparked her passion for building healthier communities. Trish is a second-generation Irish American with all familial lines leading back to County Cork. She aspires to carry the Irish attributes of “strength, perseverance, love of family, loyalty, spirituality, and the ability to enjoy life” into both her professional and personal life, which she shares with her husband, Darren Siker.